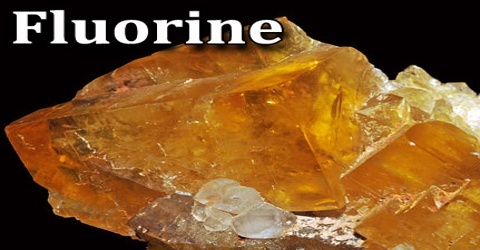 Fluorine is a pale-yellow, poisonous, gaseous element of the halogen group. It is highly corrosive and is used to separate certain isotopes of uranium and to make refrigerants and high-temperature plastics. As the most electronegative element, it is extremely reactive: almost all other elements, including some noble gases, form compounds with fluorine. Its atomic number 9; atomic weight 18.9984; melting point -223°C; boiling point -188.14°C; specific gravity of liquid 1.108 (at boiling point); valence 1. Fluorine as a pale yellow, white or colourless gas which can sometimes be fluorescent. It is present in volcanic gases and thermal waters. Its chief source is fluorite but it also occurs in cryolite, seawater, bones, and teeth. Fluorine can only be produced by electrolysis under special conditions. 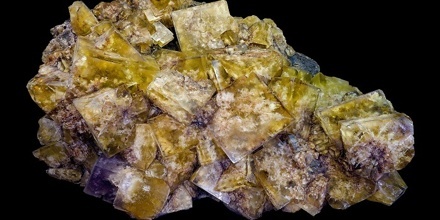 Its most important compounds are fluorite, cryolite, and topaz. 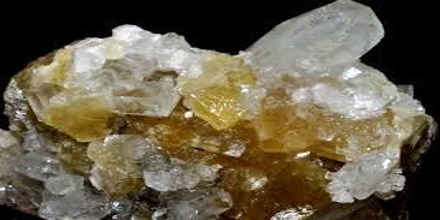 The name ‘Flourine’ was coined in 1813 the by English chemist Sir Humphry Davy from fluorspar, the name of the mineral where it was first found. Fluorspar is the chief ore of fluorine. Its composition is calcium fluoride. The mineral name of fluorspar was given by Georg Agricola in 1546, translating the German name flusse from the Latin word fluxus meaning “flowing or to flow”. In metallurgy, a flux is also derived from the Latin word fluxus and is a chemical cleaning agent or flowing agent. In 1530, German mineralogist Georgius Agricola described the use of the mineral fluorspar in metal refining. The element fluorine had not yet been discovered and the ‘fluor’ in fluorspar came from the Latin word ‘fluere,’ meaning ‘to flow,’ because this is what it allowed metals to do. The element name fluorine ultimately came from the ‘fluor’ in fluorspar. Fluorine is manufactured electrochemically from a salt melt, which consists of a mixture of Potassium fluoride and hydrofluoric acid in a molar ratio of 1:2.0 to 1:2.2. The temperature of the salt melt is ca. 70 to 130 °C. Potassium fluoride provides the necessary melt conductivity; the hydrogen fluoride consumed being continuously replenished during the electrolysis. Fluorine and Hydrogen produced contain ca. 10% by volume of hydrogen fluoride. Cooling below -100 °C strongly reduces the hydrogen fluoride content. 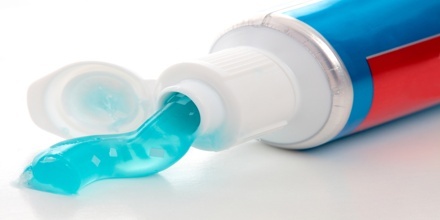 The residual hydrogen fluoride in the hydrogen is removed by an alkaline scrubber and that in the fluorine further reduced, if necessary, by passing over sodium fluoride. The fluorine thereby obtained is directly processed further to uranium hexafluoride, sulfur hexatluoride or liquefied (b.p. -188 °C) and filled into pressure cylinders. Pressure cylinders with mixtures of fluorine and nitrogen, with 10 or 20% by volume of fluorine, are widely marketed. Flurine is one of the Halogen group of elements which are highly reactive can be found in many minerals and in seawater. The Physical and Chemical Properties are the characteristics of a substance, like Fluorine, which distinguishes it from any other substance. The Physical properties of Fluorine are the characteristics that can be observed without changing the substance into another substance. Physical properties are usually those that can be observed using our senses such as color, luster, freezing point, boiling point, melting point, density, hardness and odor. Chemical properties are only observable during a chemical reaction. Reactions to substances may be brought about by changes brought about by burning, rusting, heating, exploding, tarnishing etc. Fluorine is used in many fluorochemicals, including solvents and high-temperature plastics, such as Teflon. Teflon is well known for its non-stick properties and is used in frying pans. It is also used for cable insulation, for plumber’s tape and as the basis of Gore-Tex®, which is used in waterproof shoes and clothing. Hydrofluoric acid is used for etching the glass of light bulbs and in similar applications. CFCs (chloro-fluoro-carbons) were once used as aerosol propellants, refrigerants and for ‘blowing’ expanded polystyrene. Reference: dictionary.com, rsc.org, elementalmatter.info, chemicool.com, wikipedia.